After almost a year of iOS exclusivity, one of our favorite side-scrolling games of 2015 has just arrived on Android. We're talking about Alto's Adventure, a gorgeous and addictive endless game that enables you to ride your snowboard for as long as you want, provided that you don't crash in the snow! Apart from addictive gameplay that allows you to snowboard on challenging procedurally-generated landmarks, the game features gorgeous art. 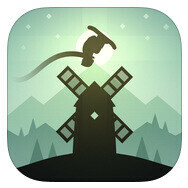 Seriously, the artwork of Alto's Adventure is stunning, there's no second opinion about this. Dynamic weather and lighting effects, like thunderstorms, blizzards, fog, rainbows, and even shooting stars further make the game an exhilarating piece of software. "But merely riding your snowboard around will get boring after a while, no? ", some of you may exclaim. Well, that's mostly true, but fortunately, Alto's Adventure comes with more than 180 challenges on board. The best part? It's currently available for free on Android. That's right, you don't need to shell a buck or two in order to grab this addictive game! This is a good news for all Android users out there, as Alto's Adventure normally sells for $2.99 on iOS. What are you waiting for? Chop chop, go ahead and grab it ASAP! Google play store: more free apps/games App store: exclusive and quality apps/games but more expensive It's just my thoughts and exceptions do exist.